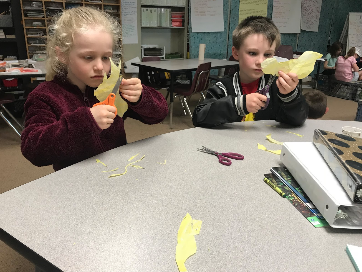 At Palouse Prairie Charter School, differentiation is an essential practice used to ensure that all students are able to meet high standards of craftsmanship. This is especially true for students working toward high quality final products. There are numerous structures to support differentiated instruction so that students are able to create work that is beautiful in conception and execution. Through the use of interventions, on-going communication with specialists, and scaffolded instruction, we support students in creating products of impeccable quality, regardless of the students’ academic ability. 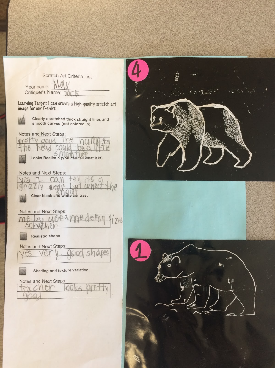 Beginning in Kindergarten, students learn how to examine exemplars and to create criteria lists and rubrics that address specific aspects of quality. Kindergarteners develop checklists that include several aspects of quality they can identify on their own. By the time students are in third grade, they are independently creating and using simple rubrics. In middle school, students are creating and using detailed rubrics to independently assess the quality of their own work. Using these criteria lists and rubrics, students are able to create work that is done with care and precision. The work of all students is refined through multiple drafts and critique from peers, teachers, and experts. Students start learning about revision in kindergarten. Using criteria lists in supported ways, our youngest students are asked to self-assess their work to improve. Teachers model how to have conversations with peers to give each other specific feedback and how to use that information to improve their work on future revisions. As students grow over time they work with experts and receive and use feedback so that their work mirrors professional formats. Students in Special Education create work that is indistinguishable from the work of their peers. All students work towards the same long-term learning targets, and teachers and students collaborate to ensure there are multiple pathways to meet the targets based on the needs of the students. All students use the character trait of courage, the habit of scholarship of grit, and work toward having a growth mindset. Because of this, they have the capacity to take risks and take on difficult challenges. This directly translates into creating beautiful work. 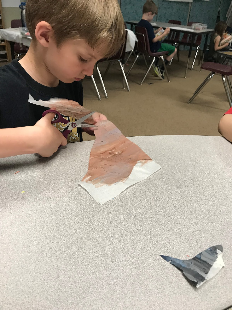 In first and second grade students studied the adaptations of local birds and the connection to the Palouse ecosystem. Students used their close observation skills to examine photos of birds, identifying the shapes and colors of specific adaptations. 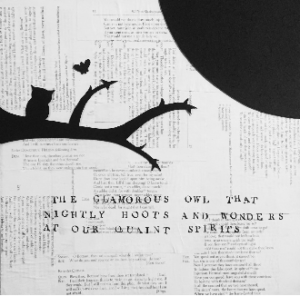 With this knowledge, students created the pieces necessary to build remarkable paper collages of the birds they studied. Through the careful use of student-created criteria lists and peer critique, students painted and blended accurate colors, cut out the right shapes in those colors and composed them into a collage of their bird. The expedition “Birds of the Palouse” is one of the original and longstanding expeditions that has grown and changed with the story of our school. In early iterations of this expedition, students sketched scientific drawings of a local bird. With the implementation of the EL Core Practice of Planning and Producing High Quality student work, teachers and students began to seek out inspiring and compelling models that would demonstrate the beauty of the birds on the Palouse. Students noticed the beautiful artwork of Steve Jenkins in Animals in Flight and wanted to use that style to make beautiful collages. This led teachers and students to examine models in order to name what quality looks like and they collaboratively created a criteria list. This process of examining elements of quality and creating lists has made creating high quality work more attainable for all students, especially our students with special needs. 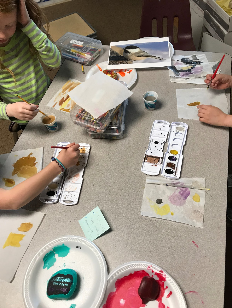 Through an authentic artistic process, students identified colors and went through workshops to blend watercolors, creating accurate colors that composed their birds. Students identified the shapes that made up the different parts of their bird, including specific beak, wing, and feather adaptations. Students participated in mini-lessons to cut shapes accurately and learned to paste shapes in the correct space to create accurate and beautiful collages. Throughout the process, they practiced collaborative skills and learned how to use each other’s strengths, knowing who to ask for feedback for different parts of the process. Students within the Special Education population were with their crew for the entirety of the process. 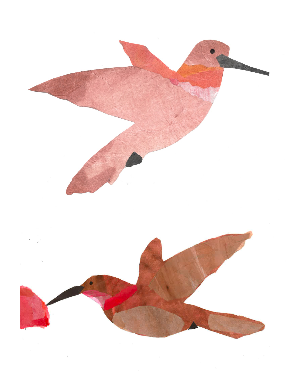 Below are two Rufous Hummingbirds. Both demonstrate the highest level of craftsmanship, with accurate colors and shapes. One was created by a student who was academically above grade level, the other was created by a student who receives daily Special Education support in all academic areas. The beauty of their work is indistinguishable. 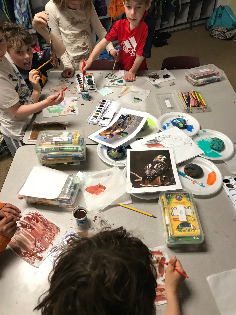 Our third grade expedition, “Call of the Wild,” explored food webs, life cycles and adaptations of two of Idaho’s most controversial species: steelhead and wolves. 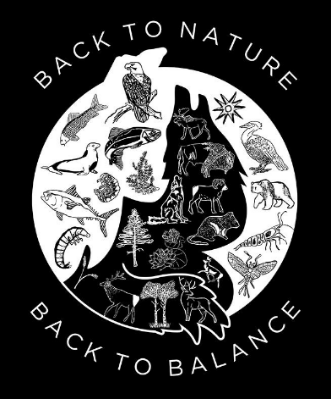 The final product for this expedition was an art piece that communicated a message of awareness for the natural world. 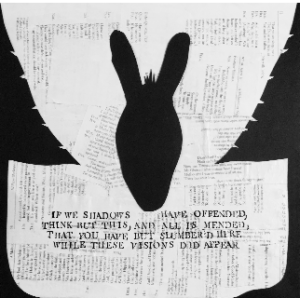 Students created the art and then as a crew, they chose a message to accompany the artwork. The process of revision is key to the quality and craftsmanship of this work. Because primary students have had multiple experiences working with rubrics and criteria lists to assess their work and make revisions, 3rd graders have a more independent and refined ability to examine an exemplar and address aspects of quality through criteria lists and collaboratively created rubrics. With students having the foundation to be able to discuss aspects of quality and ability to give and receive feedback based upon their criteria lists and rubrics, they were able to show grit as they revised through multiple drafts. Students had the capacity to make more significant changes to their work with each draft. Because the peer critique conversations were more intricate and revisions more significant, students within the Special Education population were supported by peers, classroom teachers, and specialists to assist them in identifying, comprehending, and executing revisions. 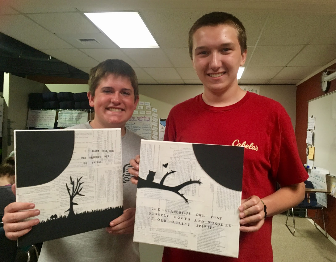 Students knew their artwork would go beyond the classroom and be shared with the larger community. They experienced the pride of knowing their work would be displayed publicly before they had internalized the benefits of multiple drafts. They wanted to contribute their best feedback and work. Below are some pictures of multiple drafts and the criteria list we used to give and receive kind, specific and helpful feedback. The final product was designed by the students, who also worked together to come up with a message to accompany the artwork. Here is the final product from the 2016-2017 school year. Below is the final product for the third grade crew from the 2017-2018 school year. 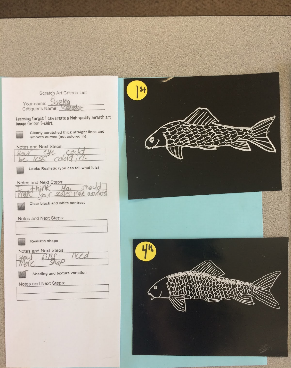 This year, each student created a scratch art fish with support from professional experts. More than 20% of these students receive additional academic supports and are identified as Special Education. Again, it is impossible to distinguish the work of these students from the work of their peers. 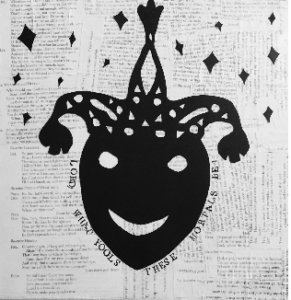 In 8th grade, students created highly intricate paper cuts based on a quote from Midsummer Night’s Dream. This product required a deep understanding of Shakespeare’s use of language, strong paper cutting skills, thoughtful design vision and a very steady hand. Their work captured the meaning and emotion of Shakespeare’s work. As students began one of their culminating final products at Palouse Prairie, they were well versed in identifying aspects of quality. They created papercuts by analyzing professional work and independently developing criteria lists and thorough, detailed rubrics. 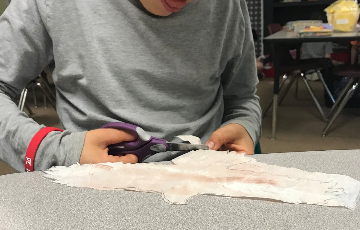 Because students knew practicing essential skills and breaking tasks down into manageable parts supported their goals of craftsmanship, they started out by working on a common cut, a bunny. This allowed them to get the feel of the necessary skills and to revise as they worked towards their final draft. It also helped them understand their strengths and limitations as they planned their quotes and artistic design. 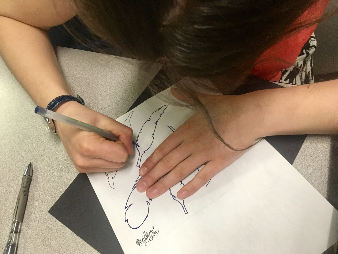 Throughout the project, students were able to hone their skills through observation of expert modeling of stamping and paper cutting techniques. Students were able to engage in and utilize feedback from expert critiques at each step of the design and artistic process. 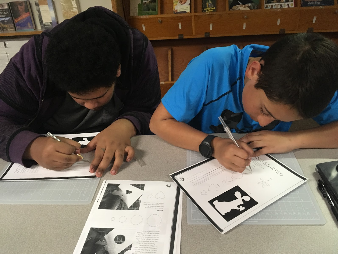 With students being more independent and knowledgeable of the benefits of a careful revision process, they were able to support their peers with varying skill sets. With support from peers, teachers, and specialists, all students were able to reach the same long-term targets and create high quality work. 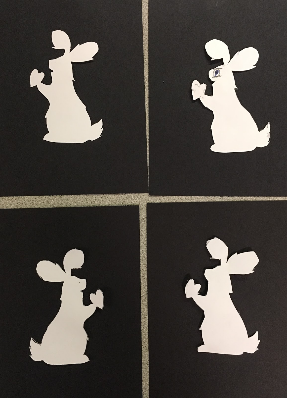 Below are four examples of papercuts by eighth grade students. Two students are academically proficient and two are receiving daily academic supports. The craftsmanship is indistinguishable. Each year the process has evolved for the paper cuts, in the first year students were given the freedom to use multiple pieces of paper to complete all the aspects of their cut. In the second year of the project students were pushed to do the process in a more authentic way to the art form, only using one piece of paper. Palouse Prairie Charter School has been recognized by the EL network as a school that is consistently capable of setting a high bar for craftsmanship of final products. We are proud of this accomplishment. However, we are most proud of our ability to help ALL students achieve a high level of craftsmanship, regardless of their academic abilities and special needs. 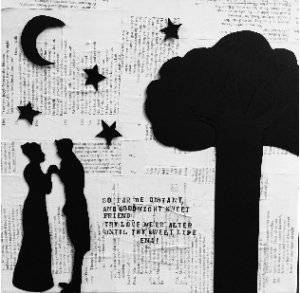 Our scaffolded processes of revision, use of criteria lists and rubrics, and our ability to work with experts support every student in creating artistically appealing work. Creating beautiful final products is our strength.